In my previous post, I gave you six top tips for writing your own wedding vows and a traditional outline structure to use as a starting point. So, you’ve written the most personal, heartfelt and meaningful vows, but what is the best way for you both to say them during your wedding ceremony? Vows placed as an aide memoire on the manuscript stand. 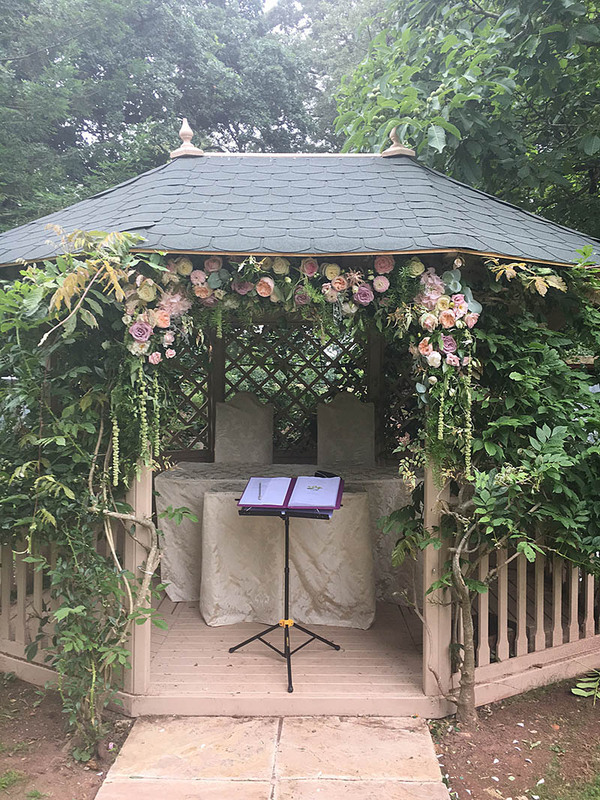 The stand will be decorated in ribbons and flowers to match the arbour and strategically placed to enable the couple to glance at their vows should they need to. As a wedding celebrant, this is a question I ask my couples to think about very carefully. It has to be a way of saying your wedding vows that suits the both of you. You may really love speaking in public and being the focus of everyone’s attention, but your partner may hate it, and may actually be dreading this part of your wedding ceremony. In my last three wedding ceremonies, each couple chose to say their vows in different ways. This shows that there are no hard and fast rules as to how you should say them, the secret is to do what you are most comfortable with. Don’t imagine that you will be able to learn your wedding vows by heart and then say them perfectly on the day. So many thoughts and emotions will be running through your mind that your wonderfully written, heartfelt words will just escape you. Don’t give yourself this worry and extra pressure, just take my word for it, you will forget important lines and words, so consider the different ways they can be delivered. For those couples who are really dreading this part, a good way to consider saying your wedding vows is to break them down into one or two short sentences, which the celebrant says first and then you repeat. This method particularly suits short, traditional, formal style vows, because in effect they are being said four times, celebrant – groom – celebrant – bride. Jokes, anecdotes, pet names etc. loose their spontaneity when repeated after the celebrant, so won’t work with this method. A great advantage of saying your wedding vows this way is that you can hold your partner’s hands, and gaze straight into their eyes as you say the words. An experienced celebrant will gauge how many lines (usually one or two short ones), the bride or groom will realistically remember, often breaking it down into slightly smaller chunks for the more nervous of the pair. Print out your wedding vows and read them from a strategically placed music stand. Most wedding celebrants have an adjustable music stand for this purpose. I like to decorate mine with a few flowers and ribbons to match the wedding colours. Make sure your wedding vows are written in a large, clear font (I recommend a serif font such as Garamond or Times New Roman, 16-point size) and printed in a different colour to your partner’s. This guarantees to make your wedding vows easy to read from a distance and ensures you say the right ones. The vows placed on music stand method works best with medium length wedding vows that fit onto one side of A4 paper. This means that you won’t have to touch, move or shuffle them in order to read another page underneath, and will make your reading of them appear effortless and seamless. For medium to long length vows, which may take up two or more pages of A4, and have very little chance of being memorized, a great way of saying them is by reading them to your beloved from beautiful parchment paper. Your wedding vows can be printed onto parchment paper and rolled and tied in ribbons to match the theme and colours of your wedding. I suggest you both use a different colour ribbon so you know which vows are yours. Untying the ribbon and unfurling the paper before you begin reciting your wedding vows creates a beautiful, expectant tension and adds to the specialness of the moment. After the wedding ceremony, the wedding vows can be re-tied and make a lovely keepsake of the day. Practise, practise, practise. Obviously the number of times you practise saying your wedding vows depends on how confident you feel. The minimum number I suggest is three times, standing and saying them out loud in front of a mirror. Think about timing and pace and say them clearly and loud enough to be heard by all your guests. Many couples are often reduced to tears by the poignancy of their words and dread the thought of blubbering through their wedding vows on the day. I have found that practising saying them greatly reduces the chances of this happening, but not completely. Finally, battling the nerves. Try to keep hydrated so your lips and mouth don’t dry up too much, hold each other’s hands for support, smile and take a deep breath, they’ll be over before you know it. And don’t forget, your celebrant will probably have a little bag, tucked out of sight, containing Rescue Remedy, Vocal Zone, tissues, some Polos and a lip balm, ask her nicely! !